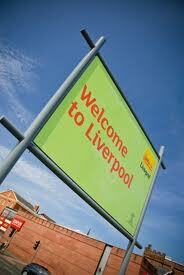 If you approach Liverpool City Centre from the north along Vauxhall Road you will eventually come to a cross roads. The turn to the right leads to the River Mersey and the Dock Road. The large green billboard on the left says, ‘Welcome to Liverpool.’ At this crossroads, though, the road signs that exist only show you how to vacate the city. I drove past it today thinking how well this irony summed up Liverpool, the always present lack of confidence and insularity that exists despite the assured wit and extrovert bravado. But the bravado is never vanquished and some was on display outside the Echo Arena. Last year I saw Elvis the Concert there with a crowd of passionate Scousers who could not believe that Elvis was finally visiting their home town. Admittedly, it was only the virtual Elvis but for the sake of history and parochial pride the audience was willing to suspend disbelief. These things pass and today when I arrived at the Arena Car Park there was instead a huge sign advertising the return of one of the favourite sons. Paul McCartney had come home and would be on stage that night, hence the bravado. This probably explained why there was a queue outside the box office on what was a cold December day. The wind that came off the Mersey had a familiar bite and opposite the Arena a big wheel turned carrying mainly empty cabins. The sky had that colour peculiar to Britain, triumphant grey. In 2011 Lautrec, Picasso and Magritte have all been honoured in Liverpool with events and I have attended them all so it is fitting that the year is ending with me looking at an Elvis exhibition in the British town twinned with Memphis and on the day McCartney was back in town. Nobody has mentioned it so far in the publicity but this is not the first Elvis exhibition in Liverpool. The last which may have been 10 years ago was initially billed as permanent. This was not the case and interest waned quickly and it closed. I know someone who has contacts with the Liverpool media and she told me that the exhibiton is intended to attract American visitors. The long standing Beatles Museum does attract Americans but only a small proportion of the Americans who visit the city. 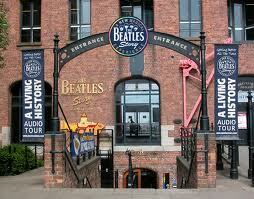 My suspicion is that the Americans who come to Liverpool because they like The Beatles will go to the Museum. Presumably, this exhibition is meant to entice the more impartial American businessman or woman. It has a chance of succeeding. The exhibition is not perfect and I spent less time in wandering amongst its stands than I did at the exhibitons for Lautrec, Picasso and Magritte but it has its moments. The admission fee is £6 and this includes a free audio commentary which is essential but there is no programme. Every museum needs a sense of history and this exhibition has it but that sense is intermittent. The two most interesting sections are those that allow original members of The Quarrymen to talk about how the band was formed and what they thought of Elvis and how he and other rock and rollers defined the world of aspiring British musicians. Of those who remember, Pete Best was the closest to the Beatles and he talks the most. This was a personal revelation for me. Back in the 70s I was a Civil Servant and, one day when we were on strike over pay, a friend of a friend brought Pete Best to the pub. The world was different in those days and we did what men did back then. We got drunk and talked politics. Pete Best was a good listener and probably said no more than half a dozen words. Although mainly silent he was extremely polite and indulged verbose young men whose lives were nothing compared to what he had experienced. In the Elvis and US exhibition, Best appears on several TV screens and he talks at length about Elvis and The Beatles and how rock and roll changed Britain. As well as anyone he captures what for all of us was a significant moment in history. It is no coincidence that Best and the other Quarrymen members all at some point refer to the Second World War. The exhibition begins correctly by setting this historical context but if Exhibit 1 is intended to convince us that in 1951 the world lacked excitement and purpose it fails badly. The photographs of an exceptionally handsome Cary Grant and a beautiful Marilyn Monroe remind us that glamour has preoccupied the human race long before Elvis. There are also references to Sergeant Bilko and the fabulous Hitchock movie, ‘Rear Window’. This is smart knowing popular culture and it existed before Elvis. But despite that the sections that deal with the arrival of Elvis are fabulous and Exhibit 4 which features clips of Elvis on stage revitalised my memories. He really was a phenomenon. The exhibition attempts to maximise appeal by combining the stories of Elvis and The Beatles but the exhibition without really trying proves that Elvis was the explosion. We may have changed more after The Beatles but that crack in the fifties is still breathtaking when seen again. Anybody who is curious about the willingness of Elvis to create himself as an American monarch only needs to watch these clips. The female adoration is still difficult to comprehend as is the humour of Elvis as he accepts this adoration as if it is inconsequential. His remarks imply the opposite but the revelation here is that he is completely unphased by the attention of his fans. In the book, Treat Me Nice, I argue that we have to accept that although Elvis was a victim he was a flawed being. There are, though, moments that remind us he could be very likeable. In one scene, he is surrounded by girl fans. One girl who is plain becomes preoccupied with an artifact, it may be a photograph. Elvis watches this girl with modest potential and ambitions. She fails to realise the miraculous has happened. For a few seconds she has the undivided attention of Elvis. He says nothing because he has to dash but he realises he can do something for the girl that is beyond her guile and confidence. He leans forward and quickly gives her a farewell kiss on the cheek that he knows will not be acknowledged. There is such affection and respect in that gesture that it is difficult not to warm to the man. The unpleasant aspects of the Memphis Mafia have been well documented. Less has been said about how Elvis welcomed severely disabled Gary Pepper into the group and nourished the dreams of someone else with modest expectations. The weaker moments of the exhibition lose that sense of history and its glimpses into random events of significance. Before the end it settles into routine hagiography. The least consequential exhibit is the largest and, inevitably, recalls the meeting between Elvis and The Beatles. Priscilla is on video and says nothing significant but it is not easy when you have a mouth surrounded by unyielding plastic. There are also long interviews with Tony Barrow and Chris Hutchins, ex-press officers they have little regard for the truth and their memories are inaccurate and a stain on the exhibition. I had hoped that someone would remember what happened before the famous meeting. This was a telephone call between McCartney and Elvis and at the time it was reported by the New Musical Express in detail. Elvis was much more communicative on that occasion and its omission from an exhibition that links the Beatles and Elvis is a serious oversight. The artifacts are the mix of the familiar and the rewarding. I was pleased to see some original vinyl pressings. Imagining Elvis handling and listening to those recordings gave me a thrill similar to when I stood in American Sound Studios and the Vice President pointed to the spot where Elvis sang ‘Suspicious Minds’ and all his other Memphis sixties hits. The best of the artifacts are the Gibson he played when he recorded ‘Elvis Is Back’ and a blue chair that was used in the sit down sessions in the ’68 Comeback Special. I am prepared to accept that the chair could have been sat on by anyone and knowing my luck it was probably used by almost non-participant Alan Fortas. That guitar, though, is different. 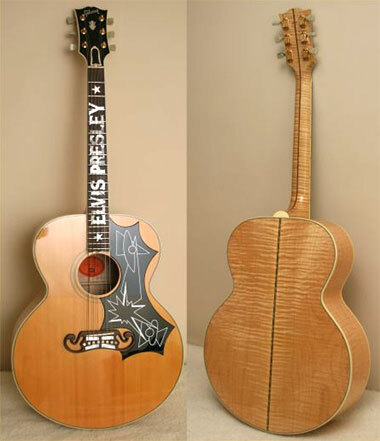 Elvis may have played more than one accoustic Gibson in those sessions but I have done a deal with my conscience. I will ignore the blue chair providing I can tell myself I saw the guitar that Elvis strummed on his classic blues recording, ‘Reconsider Baby.’ That is worth £6 of the money of anyone and, although I spent longer with Picasso and the others, it gives this exhibition the edge. I feel like I got to walk through with you! I especially appreciate the juxtaposition thinking – Elvis was the first and last entertainer that genre music fans could agree to because Elvis sang all genres. There is just something magical about listening to his voice wringing every emotional nuance possible from every song he believed in. Heck, even his phoned in performances leave most performers in the dust, given that Elvis rose above the bad material that would have sunk any other performer. 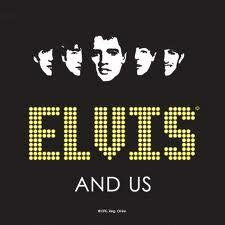 Before Elvis, the music world was divided and after Elvis, it globalized and divided again along new genre lines. Elvis’s immediate appeal was the sexual freedom, but his long term appeal was in his equality view of humanity – Elvis, having risen from the lowest socio-economic level to the highest, knew more than anyone that we are all where we came from – but it’s the quality of how we treat each other. 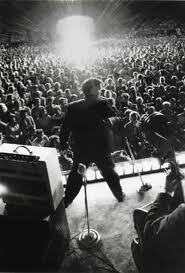 Elvis was an equal opportunity man – he paid as much attention to the plain fans as the pretty ones, because he knew that his success was owed to each of them. He treated everyone with courtesy and respect and as an equal – that was and still is a rare quality and ability – and it’s that that allows Elvis to be a champion of universal human rights, a testament to human achievement. And his end – well – what else could have happened to a man who believed in doing hard work and your best work – when all the movie studios and the record label wanted was product to churn out while the Elvis fad was still hot. Since we are all only as good as the last thing we did – and it takes 7 good things to reverse one one – Elvis was never understood by the label and studios who went for the cheap and easy money – and didn’t manage Elvis in a sustainable way. I think that if they had continued making Elvis movies – alternating the Viva Las Vegas clones with Flaming Star and Wild in the Countries – that Elvis would have developed a movie based fan following as a serious actor – and making the musical Elvis vehicles wouldn’t have run out of steam. Because Elvis only wanted to be taken seriously as an entertainer and the fans took him seriously – but the record label and hollywood only saw Elvis as an inexhaustible source of money for their real projects. It’s no wonder to me that Elvis died young – a year younger than I am right now – but that he lasted to 40 at all. Thanks for the kind words at the beginning and for your interesting thoughts. I agree that Elvis did treat all as equal. It makes me think of what Greil Marcus said in Mystery Train. In describing an on-stage triumph he used the Whitmanesque phrase, ‘No man is better than me and I am better than no one.’ This attitude and a hell lot of a talent made him special and always redeemable. For the eagle eyed, the guitar in the photos is the same model Gibson as that on display in the exhibition. The letters on the frets make it clear though that it is not the same guitar. It’s close enough and it suited my purposes.